Here are full length mp3s of the 20 tracks I planned to release as a kind of Mini-Scoop back in November of 2001. They've been up since 14 March 2002 on the PT NEWS pages as RealMedia streams, some of them edited in length. I figured it would be better to offer them as mp3s at the best possible quality. (RealMedia files do sound great as long as they encoded at high quality, but mp3 is the more common format). These tracks are truly work-in-progress and will probably not interest everyone. This is the complete thing, warts and all. Still listening to Fields of the Nephilim, Dawnrazor... Anyone who hasn't heard yet, do so immediately. It really is rather good. And who cares if they're a goth band, eh? They open the album with a rendition of Harmonica's theme from Once Upon A Time In The West, which has got to be worth something. Failing that, go for Fully Completely, by the Tragically Hip. Do you like Animal Collective? I listened to Feels a couple of times, but I couldn't get into it. It annoyed me, just like Deerhoof's The Runners Four. Those are two highly praised and much-loved records from last year that I simply don't get. Any thoughts on what you've heard from Animal Collective? Would you recommend Sung Tongs to someone who didn't like Feels? Would you recommend Sung Tongs to someone who didn't like Feels? I really couldn't say, since this is my very first listen to Animal Collective (thanks to balthazor, who sometimes posts here). I can report that I much prefer Sung Tongs to Deerhoof's Runners Four, which, despite much effort, I never really responded to. Sung Tongs relies heavily on dissonance and weirdness, but it's always appealing and melodic--and it lacks the grating female vocal that Deerhoof persists in vomiting into our ears. i went to the show last friday in madison and it was amazing. 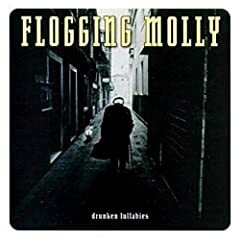 Flogging Molly is one of the greatest live bands and who doesnt love some irish rock? This sounds amazing. It's my favorite 2006 music purchase so far. Jenny Lewis is absoltely gorgeous. I just thought I'd throw that out there. Ahem, back to music. I like Rilo Kiley, so I'm going to have to check that out. Mr. Beltmann, don't let me forget to burn the Iron and Wine collection for you soon! You'd love it. Ahem, back to music. I like Rilo Kiley, so I'm going to have to check that out. I like Rilo Kiley, too, but Rabbit Fur Coat doesn't really sound like the full band--it's more light, more frail, more ethereal, more folk-tinged. Those are compliments, incidentally. The latest by Belle & Sebastian. Picked it up today, because I thought I should be familiar with it before seeing them March 11. Check out this lineup: The New Pornographers opening for Belle & Sebastian. It's like the indie-rock equivalent of U2 opening for the Stones! Jordan, you aren't going to pass up the chance to see the New P's, are you? I really hope I can make it to the concert. With VP closing, I'm pretty strapped for cash, but I've got some money coming to me within the next few weeks, so I should be able to make it. I'd never forgive myself if I missed this opportunity simply because I was completely and utterly addicted to Twin Cinema.